As every mom knows, that is far from reality. Having said that though, the opportunities do exist for you to make money while being a stay at home mom. 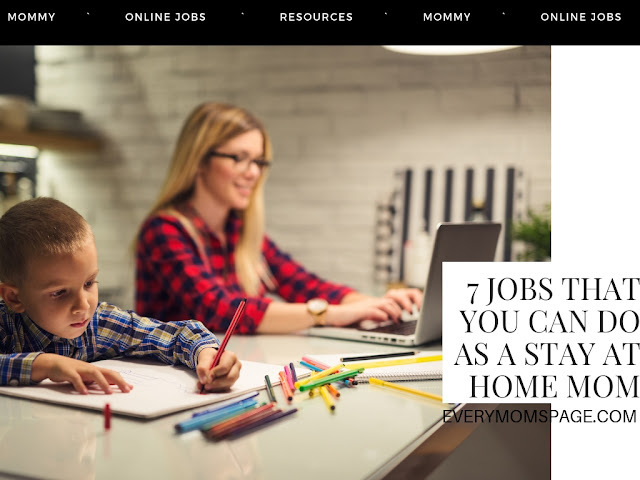 There is time for you to turn your hand to jobs you can do from home that are relatively straightforward, pay surprisingly well and as a result, can help boost your family’s income. Here are seven jobs that you can do as a stay at home mom. The fact that you are reading this blog right now points to the fact that blogging is big. It’s a particularly good job for a stay at home mom to get into because it’s flexible and the only two things that you need are an internet connection and something to say. If you make a success of it, it can also pay and pay big. While nobody is suggesting that you will end up getting close to the $14 million a month that the Huffington Post makes, even a relatively low key blog can rake in $1,000 a month through sponsored posts and paid advertising. It does take a lot of work to set up a blog, establish yourself and gain a dedicated readership with most bloggers giving up within six months due to being disappointed by the results. Battle through the tough times at the start though, and you could find yourself reaping the rewards a year down the line. Bad spelling is bad for business. According to some studies, spelling mistakes can cost companies millions of dollars in lost trade. After all, if somebody either can’t spell a basic word correctly or bother to check that what they’ve written makes sense, then why would you trust them to be able to deliver the goods or services that they are advertising? That makes proofreading big business. Many companies are now actively seeking people to go through their websites and advertising materials with a fine tooth comb to check for errors. If you’re a stickler for spelling or a giant of grammar, then you could be paid up to $40,000 a year to work from home as a proofreader. Okay, so this one isn’t a job that is going to make you money right here, right now. What studying for an online diploma will do, however, is broaden your qualifications for when the time comes for you to move back into the world of full-time employment. Across the country, there are thousands of mums taking an online course right now while looking after their kids. Imagine if, once the children are a little older and you are looking for a job, you had a basic diploma in accounting or were able to speak Spanish fluently? You can boost your prospects of well paid, meaningful employment by taking the time now to study. Stay at home moms aren’t restricted to just being the student – they can become the teacher as well. The value of the global tutoring market surpassed $102.8 billion in 2018, and as technology allows for great connectivity, more and more of that tutoring is being done online. You can teach virtually anything to anyone in the world as long as you are confident at using Skype or another video calling service. Math tuition for children who may be falling behind at high school, English lessons for a student in China who is wanting to learn from a native speaker or even webinars based on your knowledge of social media for companies who may need a hand – the world of paid online tutoring is one of endless possibilities. We’ve just mentioned social media but promoting a company through Facebook, Twitter and Instagram are becoming more and more vital to its chances of success. Most sensible business owners would recognize that these days, but many of them lack the skills or knowledge to take full advantage of the opportunities offered to them. That’s where you come in. If you know your way around various social media platforms, then you can offer your services to businesses. From the comfort of your own home, you can be paid a relatively handsome amount to promote a company through social media by coming up with engaging content from briefs and information that they supply you with. You never need step foot in an office, and you can swell your paycheque by taking on the role of social media manager for as many different companies as you like. If you’ve got a love of art and can spot a good photo, then you could start making money from photographing everything and anything you come across. Whether it is some flowers blooming beautifully in your garden or a funny sign that you see every morning on the school run, different people appreciate different works of art, and that is why you can never take a wrong photo. If you are proficient on Photoshop, then you can touch your images up to professional standard and then share your best works with Instagram. If people like what they see, they might be willing to pay for your artwork, in which case you can start selling it in the form of prints, t-shirts, tea coasters, and other items. You might even find that your online portfolio attracts businesses or individuals who want to hire you to run a project for them and will pay you for the privilege. Every stay at home mom is overburdened with laundry. It’s just a fact of life. So why not make some money while you are washing and offer to do other people’s as well? You can make up to $500 a week doing the laundry of others who either don’t have the time or just can’t be bothered.